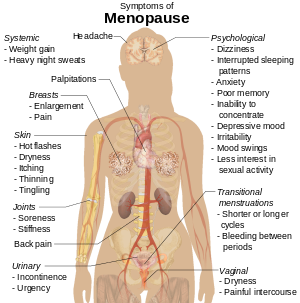 Other physical symptoms of menopause include lack of energy, joint soreness, stiffness, back pain, breast enlargement, breast pain, heart palpitations, headache, dizziness, dry, itchy skin, thinning, tingling skin, weight gain, urinary incontinence, urinary urgency, interrupted sleeping patterns, heavy night sweats, and hot flashes. ^ a b c "What Is Menopause?". National Institute on Aging. Retrieved 6 October 2018. ^ Panay, Nick; Briggs, Paula; Kovacs, Gab (20 August 2015). "Memory and Mood in the Menopause". Managing the Menopause: 21st Century Solutions. Cambridge University Press. ISBN 9781316352717. ^ a b Birkhaeuser, Martin; Genazzani, Andrea R. (30 January 2018). Pre-Menopause, Menopause and Beyond: Volume 5: Frontiers in Gynecological Endocrinology. Springer. pp. 38–39. ISBN 9783319635408. ^ Papadakis, Maxine A.; McPhee, Stephen J.; Rabow, Michael W. (11 September 2017). Current Medical Diagnosis and Treatment 2018, 57th Edition. McGraw Hill Professional. p. 1212. ISBN 9781259861499. ^ a b c d "Early or premature menopause". Womenshealth.gov. 12 July 2017. Retrieved 7 November 2018. ^ "Gynaecologic Problems: Menopausal Problems". Health on the Net Foundation. Retrieved 22 February 2012. ^ a b "What Is Perimenopause?". WebMD. Retrieved 6 October 2018. ^ "Perimenopause - Symptoms and causes". Mayo Clinic. Retrieved 6 October 2018. ^ Chichester M, Ciranni P (August – September 2011). "Approaching menopause (but not there yet! ): caring for women in midlife". Nursing for Women's Health. 15 (4): 320–4. doi:10.1111/j.1751-486X.2011.01652.x. PMID 21884497. ^ Morton RA, Stone JR, Singh RS (13 June 2013). "Mate choice and the origin of menopause". PLoS Computational Biology. 9 (6): e1003092. Bibcode:2013PLSCB...9E3092M. doi:10.1371/journal.pcbi.1003092. PMC 3681637. PMID 23785268. ^ Takahashi M, Singh RS, Stone J (6 January 2017). 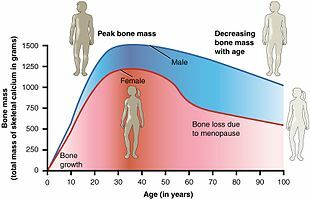 "A Theory for the Origin of Human Menopause". Frontiers in Genetics. 7: 222. doi:10.3389/fgene.2016.00222. PMC 5216033. PMID 28111590. ^ Bigg MA, Olesiuk PF, Ellis GM, Ford JK, Balcomb KC (1 January 1990). "Social organization and genealogy of resident killer whales (Orcinus orca) in the coastal waters of British Columbia and Washington State". Report of the International Whaling Commission. 12: 383–405. ^ "How long is a cat in heat?". Animal Planet. 15 May 2012. Retrieved 12 June 2018.